Shopping in Gothenburg - shopping center, malls, shoes, clothes, books, antiques. Like all major cities, Gothenburg has a variety of shopping options. You´ll find all the big chains to smaller specialist shops. All with their own specialities. Below you`ll find some stores/shopping in Gothenburg. The Nordstan mall is the largest shopping center in Gothenburg. Here you will find most stores and brands. The largest selection is clothes and shoes but you will also find cosmetics, sporting goods, books, jewelry, banks, newsagents, pharmacies, cafes and restaurants. Here you can spend an entire day. Nordstan takes up an entire block so it can sometimes be good to get help finding the right stores. 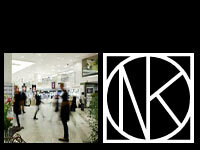 You will also find the tourist information center in the middle of Nordstan. They can tip you about what's going on inside Nordstan shopping center and in the rest of Gothenburg. Nordstan also has a range of entertainment and performances every now and then. Please visit their website to see what is going on. Located in the centre of Gothenburg, between Brunnsparken, Lilla Bommen, Gustav Adolfs Torg and Resecentrum/Gothenburg Central Station. Kronhusbodarna is a craft center with a collection of mixed shops located in the oldest part of Gothenburg next to Kronhuset. Kronhuset is Gothenburg's oldest house, the construction started 1642. Next to Kronhuset is two houses, the east and the west. Built during the 1700s and they housed the artillery turners, saddlers, blacksmiths and storage place for military trucks. After the restoration in the 70s, the cozy shops were added. Today you'll find a glass studio, goldsmith, Chocolate & Candy Shop, Pottery and Furnishings Retail. A nice cafe is located here, Cafe Kronhuset, just enjoy a cup of coffee and a bun or a sandwich. Here are a pleasure to do some shopping in Summer and Winter. During Christmas time there are usually a Christmas Market here. Located one block from Gustaf Adolfs Torg at Postgatan. As early as 1886 the first store was opened at Torggatan 24 (at the intersection of Postgatan). It was Carl Hilmer Ström that opened up his little store that is now one of Gothenburg's largest clothing retailers. During the end of the 1800s and in the beginning of the 1900s Postgatan were full of hustle and bustle and emigrants, waiting for the emigrant boats to take them to America. Many went to Ströms buying a new suit or perhaps a hat so they could look nice when they arrived in America. 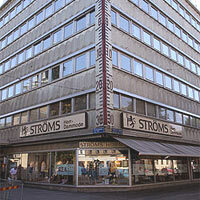 Eventually Ströms grew out of their premises and moved in 1936 to its current location at the corner of Kungsgatan/Västra Hamngatan. 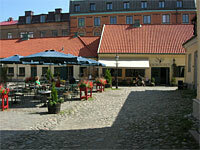 Today, the site is a known place for people to meet up, "we meet at Ströms corner". If you do not know where "'Ströms corner" is located, you can also say that we meet at the large thermometer. And yes, there hang a giant thermometer of 18 meters on the facade's corners, it was hung up 1949. 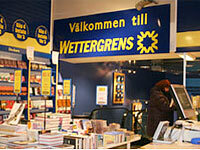 As early as 1882 the first bookstore were opened by Carl Theodor Wettergren and Kerber, then called Wettergren & Kerber Bookstore, located on Södra Hamngatan in Gothenburg, Since 2006 Wettergrens are part of the Bokia chain. Today you will find Wettergrens/Bokia all over town and with a wide selection of books, paper, pencils, office supplies, computer supplies and much more. Where today's NK house is located it has actually been a department store since 1864, when Ferdinand Lundquist opened his shop. Not until 1971 NK opened its doors in Gothenburg. It had previously been in Stockholm since 1915. Here you can shop on four floors and visit about 50 stores. If you are looking for well known brands this is the place for you. You will find, among other, Gant, Mulberry, Mexx, Ralph Lauren, RedGreen, Tiger, Levis, Boss, etc. You find clothes, jewelry, cosmetics, handbags and furnishings and much much more. In December many people are gathering outside NK to see the big windows and the Christmas decorations for the year. 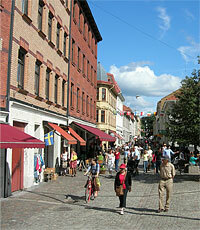 Haga is one of Gothenburg's oldest neighborhoods. Here you are greeted by the typical governor houses of wood and stone. A nice area to stroll around in and look into the various small shops that can be found here. You find everything from clothes to antiques. And after a little shopping it is nice with a cup of coffee, you have several cozy cafes to choose from. In December, it is also a Christmas market here. On Skansberget close to Haga you will find Skansen Kronan, walk up to the top and see the nice view over Gothenburg. If you like antiques you should head to Antikhallarna (the Antique Halls) in Gothenburg. In this beautiful building on Västra Hamngatan 6, the Antique Halls has been located since 1975. Take an extra look at the facade before you enter, the house is in renaissance style after Roman model. Here you will find, among other things: coins, watches, stamps, postcards, jewelry, furnitures, porcelain and art, etc.